Aubrey Joyce Carroll was 15 years old when he disappeared from his Georgia high school without a trace. Since 2016, his disappearance prompted candlelit vigils, Dateline interviews, fodder for amateur sleuths on forums and Reddit threads. “He had a support group that he was with and all indications were that he was happy and was thriving,” Dix told the Atlanta Journal-Constitution. On Tuesday, Carroll appeared in a video with Dix on the Spalding County Sheriff’s Office Facebook page. 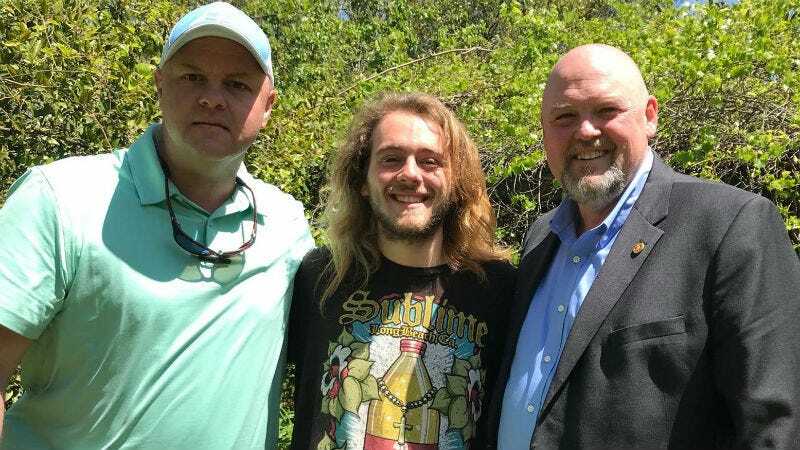 His hair is considerably longer than it was when he disappeared, and he’s rocking a Sublime shirt, looking every bit like that lovable stoner in your 10th grade English class. Spalding County Sheriff Darrell Dix said in a Tuesday statement to news outlets that they wanted to arrange a reunion without sending Aubrey back into hiding, but their plan was spoiled by a family member who warned Aubrey. When Carroll’s father, Michael, reported him missing in May 2016, he assumed his son would soon come back on his own accord. He was so confident about this that he didn’t bother telling Carroll’s mother about their son’s disappearance. Carroll is currently staying with his mother and is hopefully playing “Santeria” on maximum volume.